Free your mind and spirit in the island of Gods. Explore the luxurious green jungles, stunning beaches, or indulge in a relaxing local spa experience during this 7Days and 6Nights Adventure. Bali is the perfect place to discover the beauty of nature and inner peace in harmony. You arrive anytime and we will meet you at the Ngurah Rai International Airport, Denpasar-Bali. And transfer to your hotel and enjoy a relaxing dinner. Visit Batubalan Village and enjoy the most popular Balinese cultural show, Barong and Keris Dance. After the cultural show we will also visit other traditional balinese villages like Batuan, Celik, Kemenuh and Tegalalang, famous for its artisanal wood carving, silver jewelry and beautiful lush green rice terraces. You will have your lunch at Kintamani with a beautiful view of the Volcano Mt. Babur and the lake. After lunch we will visit Kayuamba Village, where we will see the traditional Luwak Coffee Processing and tropical fruits and spice gardens. Before we head back to the home, we will visit the famous Tirta Empul Temple (The Holy Spring Water Temple). Today we will visit the ancient Mengzi Royal family temple, Taman Ayun Temple. And also the famous Bali fruit and vegetable market. Afterwards we will head to Lake Beratan to visit the famous floating temple in lake Beratan. After lunch we will visit the monkey and bat sanctuary in Alaskedaton and later visit the famous offshore cliff temple at Tanah Lot for sunset. 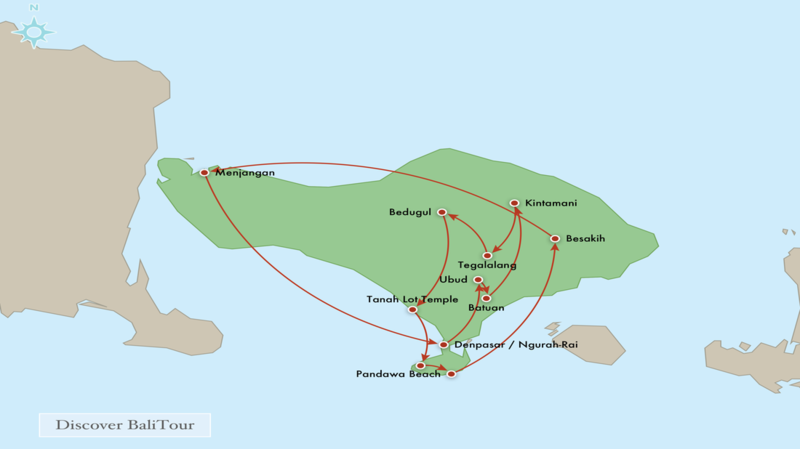 Today we will visit Tanjung Benoa, the aquatic adventure mecca in Bali. We will visit the beautiful Turtle Island in a glass bottomed boat, which will give you a beautiful glimpse of the wonderful flora and fauna underwater. Later in the afternoon we will visit the Pandawa Beach. one of the well kept secret beaches in Bali. Later in the evening we will head towards Uluwatu, the sacred temple on the cliff and watch Kecak and Fire dance performance with the beautiful sunset. Later we will have some fresh seafood dinner on the white sandy beaches of Jimbaran, overlooking the peninsula. After breakfast we will head to visit the Tohpati Village famous for its Batik home industries. Afterwards we will visit the famous fire temple in Bali, Kehen Temple and the Besakih Temple, The mother of all temples in Bali. After lunch we will also visit the famous ancient court of justice, Kerta Gosa. And the Gua Lawah Temple, bat cave temple by the sea. Before we head back to our hotel for dinner, we will visit the local Kusamba Village, where you can see the traditional salt making process from the sea water. Today we head down to Denpasar and visit the local market. Here you can shop with the locals at local prices. ​Also, we will visit various museums, royal palaces and also experience the balinese dance show at the Ubud Palace in the evening.